Point me in the direction of craft supplies for a few hours and I’m a happy camper! The supplies you “need” for your adult coloring books and Zentangle are so much fun to collect. You can get started quickly with Amazon’s Prime Free shipping. I swear sometimes I get things the next day and wonder how they can do that. You probably already have a few Adult Coloring Books and an art journal for your Zentangles and now you wonder what the best supplies are. I went to Walmart and found some very inexpensive markers that I love… but they bleed through the pages! Discovered that on the first one so now I put a piece of paper behind the one I’m working on if I am going to use those markers. They also aren’t color safe so if I wanted to watercolor on that page I would ruin the whole thing. Joanne Fink swears by Sakura pens and so far I agree with her 100% although I’ve found a few other brands I’m a fan of as well. The first thing you need is the high quality acid-free permanent black markers. These pens are just so luscious and have the most wonderful smooth paper feel when you are using them. 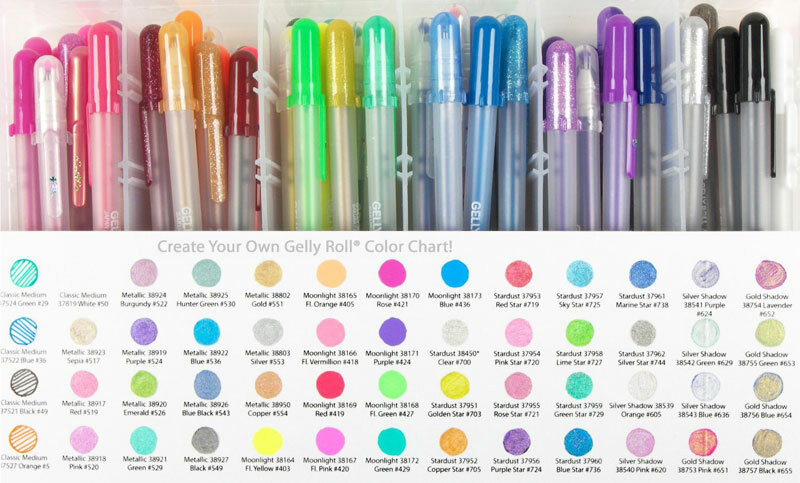 Sakura 10-Piece Gelly Roll Moonlight Gel Ink Pen Set – Gelly roll moonlight 10 (bold point) gel ink pens. Archival quality ink chemically stable, waterproof, and fade resistant. Fluorescent Moonlight colors are not fade-resistant, but no smears, feathers, or bleed-through on most papers. Best effects on black paper and can be used on white paper. I haven’t played with these very much since I tend to use white paper but they are on my next thing to try list. For me, Colored Pencils are the MOST important part of my adult coloring book arsenal of happy. I’ve written an in-depth analysis of my favorite colored pencils and why here. You can never go wrong with a basic set of Prismacolors though. Markers are a bit tricky in your coloring books, not so much with Zentangle where you normally are working on artist paper. Be sure to check the saturation of the paper before you start working on your project. More about using Markers in Coloring Books for Adults can be found here. These Prima sets are so cute! Just the tins they come in are worth the full price. I love that they come in small sets that are portable. Just bring along a water brush and you are good to go. Sakura 24-Piece Koi Assorted Water Colors Field Sketch Set with Brush – This Koi kit is a Portable field sketch kit for use on the go or at home and it includes brush, sponge, built-in palette, 24 mini watercolor cakes, plastic case with a refillable koi water brush. PEN CARE! Please store all pens horizontally when not in use. This will extend the life of all gel pens, microns etc. For more information on the ZENTANGLE craze check out my new post here. For everything, Adult Coloring Book related check out the Coloring Book Addict’s website.